This was an easy read: I finished it in a few days. For the purposes of increasing my reading abilities in German, it was good. And I must say it was a fun read as well, though not quite profound, although I am not sure the author wanted it to be profound. 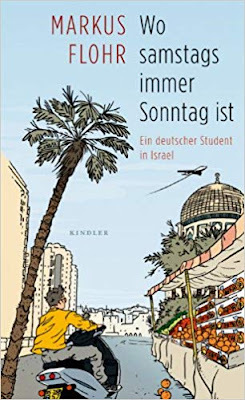 See, this book reads like it's the narrative of a young student who goes to Israel to study for a year. Nothing profound about it, more like a coming of age story. And sure enough, it does read like a coming of age story, where things are fun from Day One. From the day he lands in the airport, where he finds out that he was scammed into thinking that there's a room waiting for him in a shared apartment, things are fun, and things are adventurous. There's room to make mistakes, and even though things might look absurd, things eventually turn out well. It reminds me actually of this French movie I loved, L'Auberge Espagnole. However, slowly but surely, things start to get serious. He has an on-again-off-again girlfriend, Noa, who has issues with her family, since her family doesn't like the fact that their daughter is dating not only a non-Jew, but also a German, for crying out loud. Eventually the relationship falters, although the author suggests that this relationship has resulted in a child. The serious topic of the Arab-Israeli conflict is omnipresent in the book. It is handled in a serious way sometimes, in a lighthearted way other times. And most importantly, at least in my view, it was not biased or one-sided, which was a good thing. I didn't like how it ended. The author was eventually deported from Israel, as he was somehow involved in a bar brawl, and drugs were involved. Since he didn't have a good alibi, and he was in the wrong place at the wrong time, his visa was cancelled and he had to leave the country. I felt like this episode was some sort of deus ex machina, where the author simply exited out of a weird situation because the weird situation was the result of a narrative progression that wasn't really going anywhere. I mean, if you have weird scenarios lined up one after another, sometimes you start wondering whether this is actually real-life events, or fiction. Yes, there are parts of this book that I found hard to believe. It felt like Jerusalem was one big village, where everyone knew everyone, since the author talked about so many coincidences. You hitch-hike on a desert road and get picked up by two girls, and somehow these two girls end up popping up in multiple places later on. You get scammed by someone when you're trying to get a flat, and months later you meet this scammer in person. There's just so many coincidences that it makes me think that some of the stories are not true, but fictional. In any case, fictional or not, let's give the author his creative license back. I enjoyed reading the book, but don't expect it to be profound. It's a fun book, but once you're finished, you're probably ready to give it away to someone else and move on. I give this book 3 out of 5 stars.